Simple and SO Helpful: Installation Guides To The Rescue! There is a reason that skilled handymen use the saying “measure twice; cut once.” It’s simple, it’s true, and it saves a LOT of time and frustration. 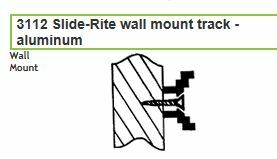 Another step that can save a lot of time and frustration is visiting our website for installation guides. We have compiled installation guides for our awesome DIY customers so you can take our expertise home with you any time. For the visual learner, we have included lots of pictures, diagrams, and arrows. For the auditory learner, there are step by step directions that you can read aloud as you work. Whatever your method, just remember that a little planning goes a long way. Save yourself the frustration of wasted time and material by referencing our installation guides and double checking your measurements before you cut anything. Screw holes can be patched; it’s a little more difficult to put together a mis-cut track, (unless duct tape is your look). Also, we have guides for every single track that we carry. Just visit our guide page and select your product to view the diagrams and guide tips. You can view the pages from your phone or computer or print them out so you can check them off and feel accomplished while you are working. You will be pleasantly surprised to know that our installation guides are written in simple, numbered directions. Gone are the days of trying to interpret directions that were originally written in another language and then poorly translated, or even worse, a diagram with little to no clarification. Yes, our customer service representatives are experts on all things curtain tracks, hardware and curtains, but we understand that not everyone talks about tracks, carriers, and mounting brackets on a daily basis. That’s why we created these easy to understand installation guides - to make your project go that much smoother.